Freshness is crucial to chef Jacques Reymond, but that comes second to letting top-notch food speak for itself. According to Reymond there’s one mistake new chefs are making. “Why do you need to have additional ingredients, condiments, fragrances, ten different herbs, you name it, when you’ve got a such a beautiful product?” he said referring to Huon Salmon. Acclaimed chef Jacques Reymond in action during Josef Chromy’s 2017 Effervescence Sparkling Wine Festival. The industry has well and truly changed for Reymond, who believes modern day chefs are more focused on looking ‘trendy’ than devoting their time to the cooking itself. Time and cooking are two things the Frenchman knows well, with Reymond successfully running his Three Hat restaurant in Melbourne, Australia for 26 years. As a result, Jacques Reymond Restaurant was awarded Best Restaurant in Australia 2014. This is just one of the many cooking accolades Reymond has under his belt. “Because today if you are not trendy, if you’re not on social media, in the newspapers, not on Masterchef… you have to play the game sometimes, except for me, I don’t care about that. Slow-cooked Huon Salmon, a basil and tomato dressing, crunchy fennel and Huon Salmon Caviar. Reymond prepared a lavish array of Tasmanian foods for patrons at Effervescence 2017, a sparkling wine festival held at Launceston’s Josef Chromy. 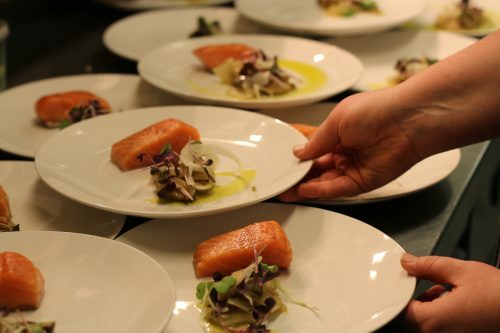 Huon Salmon was one of the main proteins on offer for guests over the three-day event. 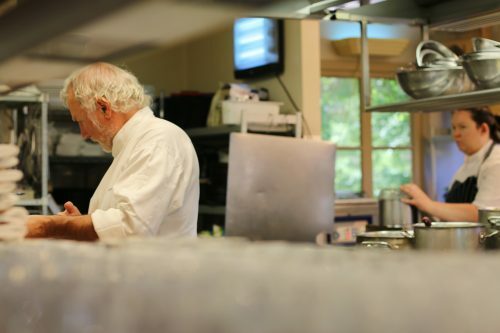 The acclaimed chef said it was extremely important to work with fresh produce to ensure proper texture and taste. “The more the product will stand by in a fridge, in a cool room, or in transport,” he said. “If not it will deteriorate because the enzyme and the proteins will effect the texture dramatically and with that it will start to get a bit stronger in flavour and in aroma and this is not what you want.